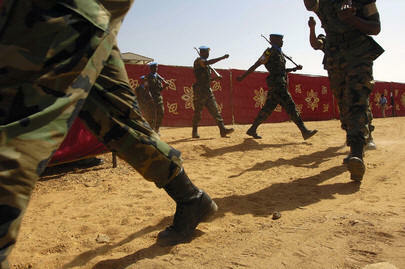 UNITED NATIONS, June 5 -- In Darfur, in Chad and the Central African Republic, where is UN Peacekeeping? Inner City Press last week asked Jean-Marie Guehenno about the long-promised deployment at least to Chad, and about the French proposal of humanitarian corridors. Mr. Guehenno, who along with his outgoing deputy Hedi Annabi skipped without notice a recent Reuters-sponsored debate on Darfur, replied that talks with Chad are ongoing. Question: Chad has said that it doesn't see a need for these humanitarian corridors proposed by France and that is one of the reasons the Prime Minister of Chad has said, because there's perfect coordination between Chad and United Nations agencies. Is that the UN's position and how has the Department of Peacekeeping Operations (DPKO) discussions with Chad about getting a force in to protect IDPs...? Deputy Spokesperson: I know the other day a senior DPKO official briefed the Security Council on the latest mission there. I believe he said that there was a forthcoming mission report in the works. So let's wait until we hear on that. On the agencies, you'd have to check with the Office for the Coordination of Humanitarian Affairs (OCHA). I don't know the answer to that question. Inner City Press: Also, there was this report... out of the Central African Republic (CAR) of the Government burning down "hundreds of homes" in retaliation for one person being killed. What is the United Nations presence in the Central African Republic? Deputy Spokesperson: The United Nations has a mission on the ground and I believe it has the regular UN country team on the ground as well. Deputy Spokesperson: I have not seen anything. Inside joke: where is Toby Lanzer? Twelve hours after the briefing, there was still no comment on hundreds of houses torched by the CAR presidential guard. Meanwhile Tuesday afternoon in the UN's Conference Room 3, the General Assembly's Fifth Committee was to meet and vote on Ban Ki-moon's proposal to split DPKO in two. But the meeting kept being postponed, for "consultations on cross-cutting issues." Soon there was log-sawing, delegates dozing off, and journalists too, in the cheap seats marked for the Sovereign Order of the Knights of Malta (that seat, we note, is taken) and the International Seabed Authority, as ACABQ's Merlin Saha worked the crowd and Messrs. Guehenno and Annabi also left the room, until at last the meeting was cancelled. Just another day at the UN. Afterwards, however, there was a photo exhibition opening sponsored by the permanent mission of China (which many, now including New Mexico's Bill Richardson joining Mia Farrow, blame for the problems in Darfur). There were paintings and photographs by Yuzhou Du, including a huge three-panel panorama of Shanghai along the river.